Like Charles Dickens’ A Christmas Carol, Frank Capra’s film It’s a Wonderful Life is a story of Christmas Eve magic whereby spiritual beings allow a mortal to explore and see alternate realities to understand the consequences of the choices they make about greed versus putting the community first. While in a A Christmas Carol Ebenezer Scrooge is visited by a series of ghosts and spirits, in It's a Wonderful Life it is George Bailey, who is visited by the angel Clarence Oddbody, who shows him what the world would be like if he weren't living his life of commitment to good work in a community called Bedford Falls. It’s A Wonderful Life is a New York story clearly taking place in this state. (There really is a Pottersville, New York and while there is also a Bedford, New York, the fictional Bedford Falls is actually probably a stand-in for Seneca Falls.) New York City is constantly evoked as the nearby big city, George’s brother goes to work for glassworks in Buffalo (that sounds like Corning), when setting up a new plastics factory is considered the choice is between Rochester and Bedford Falls and the bank examiner on Christmas Eve is going home to Elmira (another Mark Twain connection in the film). The key to much of the plot is that Bedford Falls is considered small enough to be on the edge of being taken over completely by private enterprise run amuck in the form of Mr. Potter. George, who wants to be a builder of important projects, must continually recommit to stay in Bedford Falls to counter Mr. Potter acquisitiveness. In addition to the alternative reality of George’s never having lived at all which Clarence the angel conjures for him, other alternate realities and choices for George are continually evoked. 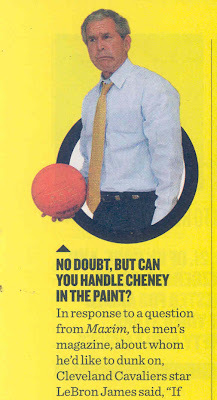 What if George made other choices instead of being there to provide a competitive counter to Potter’s monopoly? George personally has dreams of traveling and is offered multiple other conflicting opportunities. I know very well what you're talking about. You're talking about something you can't get your fingers on, and it's galling you. That's what you're talking about, I know. (to the Board) Well, I've said too much. I... You're the Board here. You do what you want with this thing. Just one thing more, though. This town needs this measly one-horse institution if only to have some place where people can come without crawling to Potter. Twice afterwards in the film the specter of George’s crawling to Potter materializes, once when Potter seeks to neutralize George as by hiring him away from the competing Baily Savings and Loan at a phenomenally high salary and the second time when George has to crawl to Potter when he desperately needs money (to cover a money he doesn’t know Potter stole from him) and sees no other choice but to beg. Here is the alternative reality we would like to imagine. What if It’s a Wonderful Life were taking place today and what if George Bailey had come to New York to escape crawling to the Potter monopoly in Bedford Falls? Ironically, what he might have found is that in New York City we are now dealing with monopolies equivalent to Potter’s Pottersville. In Brooklyn, we are speaking more and more of Ratnerville. It is a fitting thing to be conscious of this Christmas Eve because government officials just issued very suspicious bonds to promote Ratnerville. At the time of It’s a Wonderful Life (1947) we still thought in terms of government stepping in to break up monopolies (although there were those who thought the film was Communist propaganda). In the case of Bruce Ratner’s monopoly on Brooklyn it is the reverse: government is abusing eminent domain to help establish the monopoly. For more on this and the extent of the growing Ratner monopoly that sits astride Brooklyn’s subway lines, see: Saturday, November 21, 2009, Mapping Out Forest City Ratner’s Monopolistic Strategy of Subsidy Collection. If Potter gets hold of this Building and Loan there'll never be another decent house built in this town. He's already got charge of the bank. He's got the bus line. He's got the department stores. And now he's after us. Why? Well, it's very simple. Because we're cutting in on his business, that's why. And because he wants to keep you living in his slums and paying the kind of rent he decides. The depressing effects of the Ratner monopoly are real. They resulted in giving us our own George Bailey moment of choice. When we left government and eagerly thought of continuing our involvement with the building of the city we went to a developer friend we very much admire who we have known long enough for them to have attended our first wedding in the early 70s. (As a wedding present they gave us a small beautifully carved decanter.) We were at that time advised that our very best hope for the kind of job we sought was to approach Ratner. We were compelled to be honest in that moment and explain that was one thing we couldn’t do and that it would be a betrayal of our Brooklyn neighbors. On the other hand, we would have happily considered going to work for the competing developers whose options are being foreclosed by Ratner’s eminent domain abuse. This Christmas Eve we all need to look at our possible alternative realities and recommit to the proposition that we will fight against the Bruce Ratner’s government-subsidized monopoly of Brooklyn at every turn. In its story of the closing of the bonds being issued for the arena as Ratner’s first mega-monopoly step Atlantic Yards report noted the recent appearance of some of the Ratner-branded signage the community will be living with. There is supposed to be a lot more coming. In the film’s alternative reality, when Bedford Falls becomes Pottersville it too is taken over by relentlessly gaudy signage for the kind of forgetfulness-inducing entertainments with which people preoccupy themselves when they are deprived of their options and more purposeful pursuits. That sounds uncomfortably like Ratnerville to us. With today’s reported closing on the issuance of bonds for Forest City Ratner’s proposed basketball arena, developer/subsidy-collector Bruce Ratner has, with the assistance of overly-cooperative state officials, set himself up for a much bigger loss when that project fails to go forward, all the better to drive his firm into bankruptcy thus ensuring that taxpayers of this and other states will be protected against his predatory raids on public assets in the future. The more than half a billion in bonds were expensive to issue. It was a desperate move on Ratner’s part. Now, if anything prevents the mega-project from going forward Ratner will be that much more in the hole. As the Preliminary Official Statement selling the bonds set forth it could be as simple as the NBA not giving Mikhail Prokhorov league approval. It needn’t be so straightforward or simple. Ratner is vulnerable to a number of significant lawsuits, pending, coming and worth reinstating. Among other things Ratner sidestepped proper use of a public agency to issue the bonds. Instead, in a jury-rigged maneuver a private 501(c)(3) not-for-profit was set up to bypass various laws and procedures. The public officials who stepped outside their prescribed roles and public duties to assist him to take these risks have already been determined in court to have been acting in bad faith to implement pretextual schemes in almost exactly the same situation in the Columbia eminent domain case. Of course Ratner should be considered a big boy who knows the risks he has taken. This should be clear because the Preliminary Offering Statement for the bonds had Ratner, rather than lawyers, provide an assessment of the litigation risks. Nevertheless, our government officials have never treated Ratner as a big boy who should be assuming his own risks. Instead, they have repeatedly stepped in with the merest of excuses to bail him out each and every time he wails about hardship. That’s because the game these public officials have been playing is finding excuses at every turn to give Ratner more subsidy. That’s why they can never disclose to the public the negative value of giving Ratner his mega-monopoly or the way that total net loss figure grows each time more subsidy is piled on. Ratner is betting he can continue to succeed in these shenanigans despite the megadevelopment’s increasing unpopularity. What’s needed for the public good is for him to fail and we are betting he will. Ratner and all his assisting public officials were fairly forewarned that this bond transaction should have been halted ahead of time. There should be no complaints about the pain that will be experienced by Mr. Ratner by virtue of the fact that it was so inexcusably rushed through nonetheless. We just wrote about how Crain’s departing New York Business editorial director Greg David wanted to “personalize” the mega-issues and mega-destruction associated with the proposed Atlantic Yards mega-monopoly. The way he irresponsibly whittled it down was that someone named Daniel Goldstein was the sole personage responsible for holding up the arrival in Brooklyn of an unsigned basketball superstar named LeBron James. “ . . . So Daniel Goldstein, the person who's been holding out against it, had better start packing his bags," David responded, with no small satisfaction in his voice. "Cause this means that Ratner has the money to go ahead with the project. They're going to go ahead no matter how many more lawsuits Goldstein files." 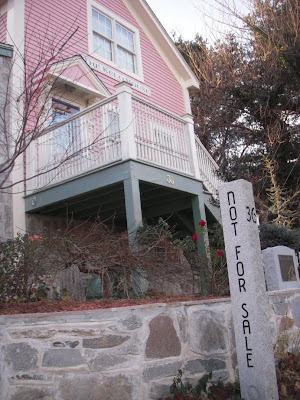 Um, Goldstein isn't the only property owner and tenant resisting eminent domain. He may be the most visible but the Atlantic Yards fight wouldn't have lasted six years and counting if it were just one guy. 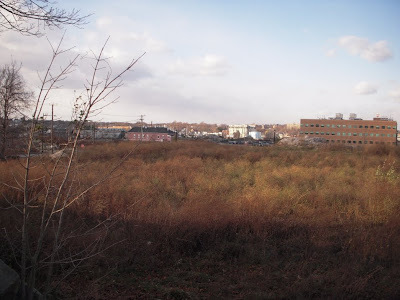 This post will supply what we did not supply in that post, a starting list of the plaintiffs, groups and individuals who have mobilized to oppose the horrific and tragically corrupt Atlantic Yards megadevelopment. We should begin by observing a couple of things. First, while Mr. David was touting LeBron James as a reason to go forward with Atlantic Yards, (“because the play . . . is to get LeBron James to come to Brooklyn"), Mr. David might find, as we pointed out, that LeBron James is amongst those with reasons to oppose Atlantic Yards. Second, as Atlantic Yards Report and No Land Grab reported, Mr. David’s own daughter is apparently already in the ranks of those opposing eminent domain abuse. Mr. David may have forgotten, but by his own admission, her opposition almost swung him over to eminent domain abuse opposition as well. Now let us get on to our list of the list. There is some repetition in the list but Mr. Goldstein’s name appears only once. Since the list begins with the plaintiffs in the eminent domain lawsuit it necessarily begins with the names of individuals but as you read through it you will see the astounding number of groups that are represented, reflecting the neighborhood and broader concerned communities. The list is long that it is easy to forget that there are many others who oppose these abuses as well. For instance, we almost forgot to mention that Noticing New York can also be added to the list of those firmly opposing Atlantic Yards. 8. Peter Williams Enterprises, Inc.
9. 535 Carlton Ave. Realty Corp.
10. Pacific Carlton Development Corp.
12. Rockwell Property Management, LLC. 3. Willets Point United, Inc.
1. Develop Don't Destroy Brooklyn, Inc.
8. Bergen Street-Prospect Heights Block Association, Inc.
12. Carroll Street Block Association (5th to 6th Ave), Inc.
13. Crown Heights North Association, Inc.
4. William A. Lashley, Jr.
1. Develop Don’t Destroy (Brooklyn), Inc.
2. Council Of Brooklyn Neighborhoods, Inc.
3. Atlantic Avenue Betterment Association, Inc.
4. Brooklyn Bears Community Gardens, Inc.
5. Brooklyn Vision Foundation, Inc.
6. Carlton Avenue Association, Inc.
8. Crown Heights North Association, Inc.
9. Dean Street Block Association, Inc.
11. East Pacific Block Association, Inc.
12. Fort Greene Association, Inc.
13. Fort Green Park Conservancy, Inc.
15. Park Slope Neighbors, Inc.
17. Prospect Place Of Brooklyn Block Assoc., Inc.
18. Society For Clinton Hill, Inc.
20. South Portland Block Association, Inc.
49. Ms. Martha Wilson – Artist and Founding Director, Franklin Furnace Archive, Inc. In the WNYC broadcast Mr. David was inclined to see the mega-issues and mega-destruction associated with the proposed Atlantic Yards mega-monopoly in terms of only two individuals: Daniel Goldstein whom he singled out of the countless community groups, elected officials and other plaintiffs beseeching the courts to block Atlantic Yards, and Mr. James. The way he saw it everything pretty much boiled down to Daniel Goldstein needing to “pack his bags” so that LeBron James could move in if James is possibly acquired for Bruce Ratner’s Nets basketball team. In personal terms, however, Mr. LeBron James may not be such a good personal fit for Mr. Bruce Ratner. . . this misdirection of public funds . . . it is not unique to New York State; it looks as if we caught some bad habits from George Bush's exploits in Texas. Johnston's book [David Cay Johnston's Book Free Lunch: How the Wealthiest Americans Enrich Themselves at Government Expense (and Stick You With the Bill).] catalogues multiple ways we are being fleeced to make the super-rich richer. He tells of phantom taxes that wealthy individuals and corporations don't really pay and the tale of the Texas Rangers stadium whereby public taxes transformed George W. Bush's 2% $600,000 sporting investment into a $17 million capital gain. And for those of us who don't live in Texas? Well, in Brooklyn, New York, where I live, Bruce Ratner of Forest City Ratner Enterprises has taken his cue from George W. Bush and surpassed him; he's planning a sports arena for his recently purchased basketball team as a key part of his proposed mega-development known as Atlantic Yards. New York government officials are committing New York's public to pay subsidies of more than a billion dollars covering all of the escalating costs of a basketball arena that the politically connected Ratner and company will own. The subsidies were awarded on a no-bid basis and the developer is even being promised that after an initial 30-40 year lease term accompanied by tax exemption, Ratner can extend his lease up to a total of 99 years with continued tax exemption. Bush needed 17 acres to build his Texas stadium. 200 acres were condemned. Ratner has similarly gone after gratuitous condemnations with a peculiar project footprint that would be inexplicable were it not for eminent domain's attractive windfall. Maybe someone like Crain's departing Mr. David who seems to reflexively promote big development “churns” benefitting the political class and the likes of George W. Bush at the expense of the public, might argue that Mr. LeBron selectively dislikes Mr. Bush for reasons other than those sort of things that are objectionable about Atlantic Yards, but we consider Bush’s propensity for cronyistic misconduct as all of a piece. We would hope that if LeBron James has a high level of intolerance for nefarious conduct by public officials that he would also have a high level of intolerance for the misconduct and political manipulations being engaged in by Bruce Ratner, the man who wants to capture Mr. James as his employee and who is already using his name to promote unsavory schemes. Don’t charge patients too little because, if you do, they won’t value the services you are providing them and they won’t do the work required. Why do we bring this up? We took a trip last week to 8 East Street, New London, Connecticut. That is the address of the site where Susette Kelo used to have her home. As our photographs attest, the site is now a weed lot in a neighborhood of weed lots. 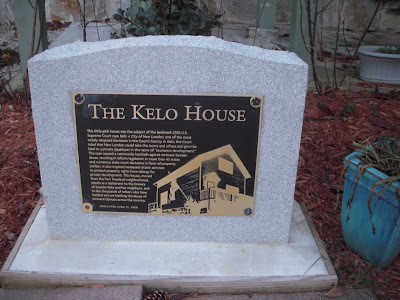 If Susette Kelo had gotten her druthers it wouldn’t be that way: Her home would still be sitting on that site paying taxes in the neighborhood of taxpaying owners that used to exist there. . . a waterfront conference hotel at the center of a "small urban village" . . . restaurants and shopping. . . . marinas for both recreational and commercial uses. A pedestrian "riverwalk" [to] continue down the coast . . approximately 80 new residences organized into an urban neighborhood . . . space reserved for a new U. S. Coast Guard Museum. . . office and retail space, parking, and water-dependent commercial uses. The NLDC intended the development plan to capitalize on the arrival of the Pfizer facility and the new commerce it was expected to attract. "whether, in fact, the development plan is of primary benefit to ... the developer [i.e., Corcoran Jennison], and private businesses which may eventually locate in the plan area [e.g., Pfizer], and in that regard, only of incidental benefit to the city." 2 App. to Pet. for Cert. 261.
. . benefiting Pfizer was not "the primary motivation or effect of this development plan"; instead, "the primary motivation for [respondents] was to take advantage of Pfizer's presence." Id., at 276. Likewise, the trial court concluded that "[t]here is nothing in the record to indicate that ... [respondents] were motivated by a desire to aid [other] particular private entities." Id., at 278. See also ante, at 7-8. Even the dissenting justices on the Connecticut Supreme Court agreed that respondents' development plan was intended to revitalize the local economy, not to serve the interests of Pfizer, Corcoran Jennison, or any other private party. "The record clearly demonstrates that the development plan was not intended to serve the interests of Pfizer, Inc., or any other private entity, but rather, to revitalize the local economy by creating temporary and permanent jobs, generating a significant increase in tax revenue, encouraging spin-off economic activities and maximizing public access to the waterfront". . . reviewed a variety of development plans and chose a private developer from a group of applicants rather than picking out a particular transferee beforehand, id., at 273, 278; and the fact that the other private beneficiaries of the project are still unknown because the office space proposed to be built has not yet been rented, id., at 278. Although, the developer, Corcoran Jennison, and other private beneficiaries were ostensibly for the purposes of the official record and the Supreme Court’s opinion not known ahead of time, the relatively synchronous identification of Pfizer is a problem. The trouble with economic development takings is that private benefit and incidental public benefit are, by definition, merged and mutually reinforcing. In this case, for example, any boon for Pfizer or the plan's developer is difficult to disaggregate from the promised public gains in taxes and jobs. See App. to Pet. for Cert. 275-277.
. . . against all common sense, that a costly urban-renewal project whose stated purpose is a vague promise of new jobs and increased tax revenue, but which is also suspiciously agreeable to the Pfizer Corporation, is for a "public use." Pfizer's withdrawal from the city will likely be a setback for a proposed hotel at Fort Trumbull. While the hotel would have attracted the general public as well as those visiting the proposed U.S. Coast Guard Museum at Fort Trumbull, Joplin said Pfizer had planned to make use of it as well.
. . . The NLDC's [an government agency comprised of local development officials] goal was to make Pfizer happy, and Pfizer executive George Milne put his company's wish list in writing. "Our New London expansion requires the world-class redevelopment planned for the adjacent 90 acres in … Fort Trumbull," he wrote in 1999, itemizing the amenities Pfizer was looking for: "a waterfront hotel with about 200 rooms, a conference center and physical-fitness area, extended-stay residential units, and 80 units of housing." 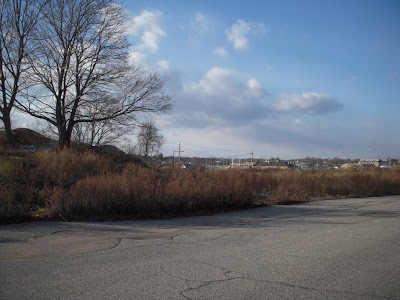 Accommodating the families already living in Fort Trumbull, however, was not a part of the Pfizer/NLDC vision. As another Pfizer executive condescendingly told the Hartford Courant: "Pfizer wants a nice place to operate. We don't want to be surrounded by tenements." 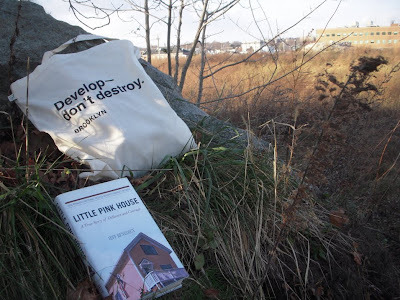 FYI: For another review of "Little Pink House" see Atlantic Yards Report's. We are making a point of two things here: How far the societal norms were bent out of shape in order to pile benefit on Pfizer and the fact Pfizer is taking a walk nevertheless. At first blush the principal relationship between those two things may seems to be its sadness, but probably isn’t. More likely the most important relationship between these two things is that the heedless piling on of benefits to Pfizer may actually be regarded as a cause of Pfizer’s departure. That, by analogy brings us back to Sam’s rule: What you don’t charge for is likely to wind up being undervalued. Development, like psychoanalysis, should not involve an investment of commitment or effort on only one side. What is sad is that what was bulldozed for the unappreciative Pfizer’s benefit was just the opposite: It was people like Susette Kelo and her neighbors who, having invested in their property without subsidy and fully paying their taxes, were not going to leave. The lawsuit brought by Ms. Kelo and her neighbors, in fact, reflected their tenacious fight and commitment to stay. Had they been allowed they would be there still, still paying taxes. Ironically, and in an endorsement of what in retrospect seems a none-too-wise public policy, the willingness of public officials to bestow excessive largess factored into the Supreme Court’s upholding of eminent domain to give Pfizer benefits. Justice Kennedy commented favorably upon the way the Connecticut courts credited their decision in part to the government’s “substantial commitment of public funds by the State to the development project before most of the private beneficiaries were known.” Of course a second problem with this (not even in retrospect) is that Pfizer, the main private beneficiary, was already known. To fully understand how much Pfizer was given to convince it to want what it didn’t finally value one needs to understand how much of a subsidy eminent domain really is. Eminent domain is used to acquire land at a greatly reduced cost. By definition, (and this is particularly important when the forced transfer is from one private owner to another) the party being deprived of their property receives far less than they ought fairly to receive. It is integral to the economics that drive these transactions which are making these forced transfers from one private party to another popular with government officials willing to hand out political favors. Waterfront hotels, marinas, restaurants and shopping, office space commercial uses and “riverwalks”may all sound marvelously optimistic, but the fabulous optimism is all at somebody else’s expense and when it is at somebody else’s expense it is all unlikely to happen. Pfizzer’s bye-bye may bring to mind that the talk these days about the hazard of IBGYBG economics (I’ll-Be-Gone, You’ll-Be-Gone). IBGYBG economics accounts for the failure of mortgage-backed securities packaged by originating banks who gave no thought to the risk, credit worthiness or warranties of their product because they made all their money up-front selling the product to others not planning to hold any of the portfolios themselves. That is not exactly what happens with eminent domain abuse but there is a certain cultural commonality of approach when the professionals involved are intent on what they are getting for themselves at the expense of the larger community. And, in fact, it turns out that the Pfizer story is replete with a lot of characters who did soon enough become goners. 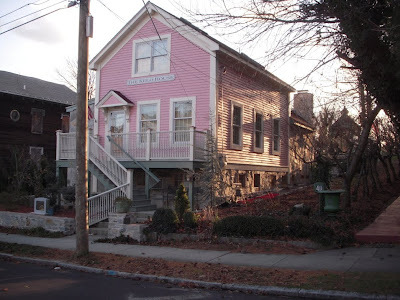 Pfizer’s recent announced departure provides a significant addendum to the informative epilogue that Jeff Benedict includes in “Little Pink House”. We heard Mr. Benedict speak at Columbia University Law School where he supplied similar epilogue material last January at an event hosted by the Federalist Society. It is worth wondering if the reasons that eminent domain projects are themselves ill-fated is relates to the fact that those involved with perpetrating eminent domain abuse similarly often do not seem to do well. • Peter Ellef, former chief of staff to Gov. John Rowland, “was sentenced to thirty months in prison for his part in the scandal” (Mr. Ellef’s involvement with Rowland’s scandal involved taking some of his own kickbacks from contractors in the form of gold coins). • “The head of Pfizer who was behind this project is out.” The head of Pfizer from January 2001 was Hank McKinnell, who is not mentioned in Mr. Benedict’s book so Mr. Benedict was likely referring to George M. Milne (see below), president of Pfizer’s central reaserch who was very much involved. Mr. McKinnell, having come up through the Pfizer ranks where he was involved in strategic planning for the corporation, resigned in 2006 after an unpopular tenure presiding over declining stock prices that were attributed to an expansionist agenda where Pfizer acquired and merged into itself smaller companies unwisely bought for too much. Ultimately it was the board that was dissatisfied but “Yank Hank” was a refrain with employees. Ironically, while Pfizer trampled property rights in New London, Mr. McKinnell was reputedly a very aggressive defender of Pfizer’s own patents and intellectual property rights. The moral is that eminent domain is a gift to developers that doesn’t keep giving (or ever give) to the public. This holiday season we are therefore giving some thought to gifts that really could keep giving. We suggest that making gifts to fight eminent domain exactly fits the bill. But every dollar given to fight eminent domain will get used and will provide a more vibrant economy as a result. If you want to fight the fight nationally you can donate to the Institute of Justice’s Castle Coalition. Since Noticing New York’s stomping grounds are New York and since, as expressed by Institute of Justice staff attorney Bob McNamara, New York State is “the worst abuser of eminent domain in the United States and believe me, that is a difficult race” you might want to consider donating that money closer to home. 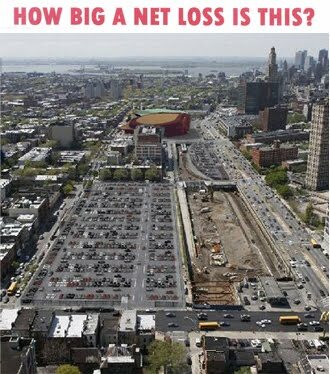 There is the Columbia University Expansion (Nick Sprayregen has spent somewhere between $1 and $2 million to defend himself against eminent domain) and then there is Willets Point. At the moment Atlantic Yards opponents are particularly in the thick of things and in the need of resources to outlast their adversaries. The perfect holiday gift? Make a donation to Develop Don’t Destroy Brooklyn, the lead opponents against Atlantic Yards. Or you might want to consider purchasing lots of these very handsome and convenient Develop Don’t Destroy Brooklyn tote bags which will support the cause. 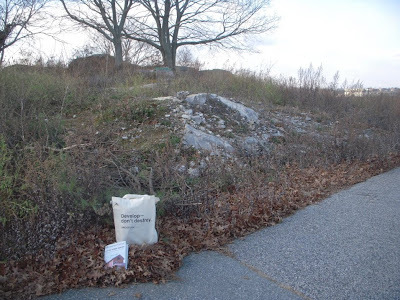 (See: Gift Idea: Develop Don't Destroy Bag.) Give the gift that keeps giving to fight he gifts that keep taking. One way in which none of us would like the Atlantic Yards epilogue to sound like the Pfizer epilogue is for it to end with a blight-delivering loss. 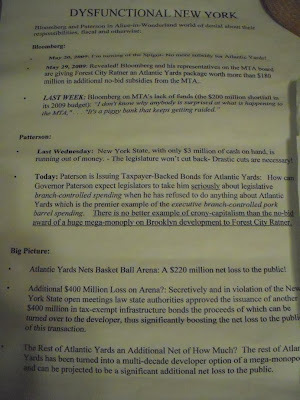 Asked About Taking a Promised Hard Look at Atlantic Yards Before Issuing Arena Bonds Does Paterson Understand AY? 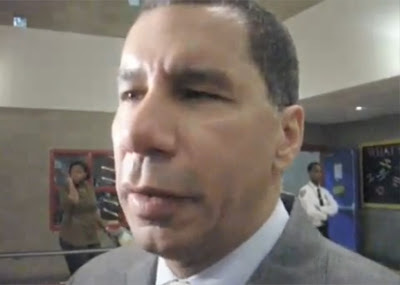 Governor Paterson was asked questions today about the hard look his administration said it would take at Atlantic Yards. Questions came from Norman Oder of Atlantic Yards Report (see, Saturday, December 19, 2009, Hail Mary or silver bullet: Perkins, raising questions of fraud in arena bond sale, asks Paterson to put Atlantic Yards on hold) and Noticing New York was able to ask our own question at the same brief press conference. At a critical time the governor probably still needs to get up to speed on Atlantic Yards. NNY: Governor, you are trying to close a budget gap and the MTA is trying to close a budget gap. You said that you will take a serious, hard look at the Atlantic Yards project. That project is perhaps $2-3 billion in public subsidies and it’s calculated by the city Independent Budget Office to be a $220 million net loss to the public, that’s the net loss not te cost. Don’t you think that perhaps taking that serious look should happen before bonds are issued for the arena? Paterson: The bonds were issued for the arena. There are a number of projects that probably add up to tens of billions of dollars that we could take off the table if we were trying to save cash. The whole premise of these sort of public-private arrangements is to create jobs and bring revenues back into the state. So, if you take a snapshot in time it is a loss. If you take a snapshot in time funding the educational system is a loss, but the revenues that you generate from the workforce in the years to come far outweigh the investment that you make. The governor’s statement that the bonds have been issued is not correct. Goldman Sachs has found buyers for the bonds but the bonds are not currently scheduled to be “issued” until this Wednesday, December 23rd, and that date could be postponed if the governor and his counsel decide they need time to think about whether they should be issued at all. This is a very important distinction for the governor to understand since he had just finished answering questions from Mr. Oder about the serious likelihood that the bonds, if issued, would be illegal. If the bonds were unwisely issued it would involve a much messier unwinding of the transaction. When he initiated his answer by stating that the bonds “were issued” for the arena the governor might have meant to communicate that an issuance might foreclose some of his options. We can’t say whether this is what he meant because he flew off before there was time for follow-up. What is important is that it is critical for the governor to act before any issuance precludes his best options. Can the Public Snap Out of $220 Million Net Loss? The governor’s belief that the $220 million net loss calculated by the NYC Independent Budget Office could be erased with the passage of time ignores how that net loss was calculated. The loss to the public is permanent since it was calculated with the passage of time taken into account. In fact, as we commented recently, given the loss to the public that the arena would represent if it is ever built, the next step that could readily make sense is to consider benefitting the public by immediately tearing it down. We thought it was interesting that the governor compared Atlantic Yards to "the education system" rather than to another comparable capital spending project when he was looking for a comparable expense. It was a strange reach. There are plenty of other projects that could be built that would not be a net loss. Why not let those projects generate jobs and revenues “in the years to come” that “far outweigh the investment that you make.” In terms of possible comparisons, the real question is whether anyone can think of a project worse for the public than Atlantic Yards? We think not. We are having an open competition on this, we keep asking, and so far no one has identified even a close second for the title of worst New York boondoggle. The questions being raised about whether the BALDC bonds would be legal are related to the fact that the Empire State Development Corporation (ESDC) is trying to sidestep requirements like Public Authority Review Board approval and review by the state comptroller Thomas DiNapoli. Its sidestepping involves using the ghostly “co-administered" Job Development Authority (JDA) to do something the legislature never granted authority for it or JDA to do. To this end, JDA is being asked to create still another entity, a local development corporation, the Brooklyn Arena Local Development Corporation, that would somehow be able to do what neither ESDC nor JDA have authority to do. We have previously criticized the hellbent and desperate sloppiness with which the issuance of these bonds has been pursued. For more analysis of the legal questions being raised by with respect to the issuance see: Perkins Pounces on PILOT Problem, Sees "Spectre of Fraud" With Atlantic Yards Arena Bonds, 12.19.09. Having looked at JDA’s statutory authority, which is something of an unattended relic, it seems clear to us that JDA was created for entirely different purposes and programs and that JDA has no authority create an entity like BALDC for the purposes of the proposed arena bond issuance. In fact, it seems quite the opposite: such actions are proscribed. Further, it looks to us as if the actions now being undertaken are potentially likely to put some of the public officials involved, including the governor's counsel, Peter Kiernan, in some serious legal jeopardy. JDA has the power to create local development corporations (LDCs) but only for very specific limited purposes. Under Article 14 of the Not-For-Profit Corporation, pertaining to “Special Not-for-profit Corporations” JDA is authorized to create LDCs that construct, acquire, rehabilitate and improve for use by others “industrial or manufacturing plants,” and the statute says “but not for any other purposes.” Since an arena can’t be considered an industrial or manufacturing plant, that sounds like a pretty clear instruction not to do an arena. Furthermore, the way in which the statute is written clearly recognizes that without the specific finding it includes that “public officers” (like the governor’s counsel) forming an LDC for other purposes would not be performing a governmental function consistent with their duties as public officers. Normally, there are significant problems when public officials are involved with private corporations as these LDCs are. So JDA (and public officers) can create and LDC for the purpose of promoting “industrial or manufacturing plants” but not an arena. We add this to the other legal problems identified with respect to the BALDC arena bonds. Addendum: (Posted December 21, 2009) Here from Atlantic Yards Report coverage of this post is video of our exchange with Governor Paterson. Big Picture Questions: Does MTA Chairman Jay Walder Comprehend Atlantic Yards Link to MTA Cutbacks? Were We Really Heard by the MTA’s Chair? Our message was that the MTA’s giveaways to the proposed Atlantic Yards Forest City Ratner mega-monopoly are probably the most prominent example of why the MTA is was having to vote to implement these cutbacks. After we and the rest of the public spoke, MTA Chairman and Chief Executive Jay Walder made a statement that sounded uncannily as if he had listened to and taken to heart what we and others said that morning about the drain on the budget due to Atlantic Yards. Maybe it sounded that way until you remember how politicians and political appointees with an idée fixe about the Transaction Fixée (The Wired Deal) can mouth all the words of good, responsible government without meaning any of them. Diverting financial resources into Atlantic Yards is making the MTA budget cuts necessary in a number of ways. 1. Wasteful Mind Set. First, the support for Atlantic Yards establishes a strange mind set for wasting public dollars. As we pointed out, the arena for which state agencies now propose to issue bonds will be a net loss to the public. 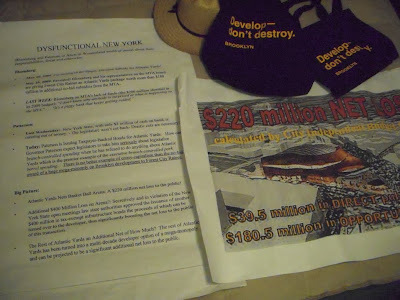 The NYC Independent Budget Office has conservatively calculated that net loss at $220 million dollars. With changing events the exact figure for the public’s net loss could be tweaked a little bit but is apparently growing. The portion of the taxpayer-supported bonds that were initially supposed to be issued to finance the arena are in a slightly lower amount than originally projected, which will reduce the figure somewhat, but New York City is mysteriously suddenly ponying up another $31 million dollars which increases the net loss. Further, it turns out that an additional $400 million in tax-exempt bonds were secretly authorized in violation of the state’s open meeting law. Unless that issuance is prevented it will really drive up the net loss to the public, to about $620 million. We are not talking about how much the project will cost the public; we are only talking about the net loss it will be after much greater public expenditures that will, all told, come to $2-$3 billion. That the arena will be a net loss to the public is not the same thing as saying that, once built it would be profitable for the public to tear it down again but it is pretty close to that. In this case the arena is likely to be such a drain that it might well be worthwhile to do so. 2. Hundreds of Millions Lost to MTA. Atlantic Yards represents the MTA disposing of assets and opportunities worth hundreds of millions of dollars that could be used to close its budget gap. 3. State Budget Cuts to the MTA. The emergence of the MTA’s deficit in recent weeks is partly because of $143 million in state cuts. The state (in addition to what the MTA is spending on Atlantic Yards) is misdirecting far more than this $143 million state cutback amount into Atlantic Yards. 4. City Funds Not Available. The MTA is making the argument that part of what it is cutting back, free Metrocards for New York City highschool students, are expenses that the MTA should not bear and that others should bear instead. The city (which mysteriously just came up with another $31 million for Atlantic Yards) easily has more than enough money that it is misapplying to Atlantic Yards to make this debate academic if those funds were properly redirected. Among other things, the city is forgoing a huge amount in real property taxes on the arena and is putting in more than a hundred million additional dollars into the project in direct expenditures. "Cancel the sweetheart deal for Forest City Ratner," said Council Member James. "Forest City Ratner should pay the $100 million owed now for the purchase of the Vanderbilt Yards. I also question why Forest City Ratner is not being made to pay the millions of dollars owed for the naming-rights deal upfront? And, had the MTA accepted a higher bidder, they would have received their funds upfront and their current budgetary gap could have been cut almost in half." Wednesday morning we only had two minutes to speak. We did our best to make some of our above stated points succinctly and so say a bit more in addition. We started out by telling the MTA board that they didn’t “get the big picture” and to assist them in getting that big picture we brought some BIG posters which we held up as we spoke. See the picture below (click to enlarge). We also focused on the way that the MTA didn’t obtain bids from Forest City Ratner before it gave away its property. It didn’t obtain a meaningful bid in the very first instance and this summer when presented with another meaningful opportunity and every reason to do so the MTA again sidestepped getting any bid. We pointed out that the last time we had been in the room the MTA had made a point of having its representatives tell the waiting press outside that it was not getting bids to compete with Ratner because there were no other potential bidders. We pointed out that it was clear from the record of its own board meeting that it had not even considered doing so. They really couldn’t get any other bids?, we asked. We pointed out that Willets Point just got 29 responses to its Request for Qualifications from developers and that Coney Island just attracted 50 interested bidders. We told the board that members it was clear that the reason they didn’t even try to get other bids was that they were treating Atlantic Yards as rigged deal, the point of which was to give a handout out to FRC. The developer for the Atlantic Yards project has scaled back its offer for an MTA rail yard in Brooklyn. Instead of paying 100 million dollars at closing, Forest City Ratner would give the MTA just 20 million dollars up front, then pay the rest in installments, with interest, over the next 22 years. MTA chief financial officer Gary Dellaverson says the MTA should take the offer because it would be risky to find a new buyer. DELLAVERSON: I have no idea when it would be more propitious than now to engage in a second transaction on this property. The replacement rail yard that Forest City Ratner would build for the MTA would also cost less, with 25 percent less capacity than the original design. The full MTA board could vote on the new offer when it meets this Wednesday. The MTA board overwhelmingly approved a new deal for the Atlantic Yards development in Brooklyn by a 10 to 2 vote. REPORTER: Some board members expressed regret that they were accepting less cash up front and a less valuable rail yard than originally proposed in 2005. But Jeff Kay, who represents Mayor Bloomberg on the board, said it was better than nothing. KAY: There is no other market, no one else has come forward with a credible proposal at this time. REPORTER: At the last minute, opponents of the Atlantic Yards project offered to pay $120 million over a period of 12 years for the rail yards. Developer Bruce Ratner is paying $100 million over 21 years under the new deal. Board members did not appear to take the counter-offer seriously and the board chairman refused to comment when asked about it. The MTA couldn’t find interested bidders to bid against Ratner? The developers we know are interested. Forest City Ratner had begun significant work on the Vanderbilt Yard under a license agreement. The city and state had contributed well over $200 million in subsidies, part of a $305 million direct allotment. And FCR had bought most but not all of the land needed for the project. The MTA said that a new appraisal would not only have "seriously jeopardized" its efforts to maximize its return regarding the disposition of Vanderbilt Yard property rights, but also the costs associated with track relocation and platform construction. But the latter is because FCR was already working on it. As Forest City said in legal papers, "ESDC and FCRC already have achieved substantial progress in implementing the Project, and the public would not be served by opening the Project to new bidding." Forest City Ratner’s rights have now been restructured to give it an option to do only as much of the megadevelopment as it ultimately decides it wants to. That restructuring is, of course, absolutely inconsistent with the idea that other developers can’t replace Ratner. So there’s one story for the public and the press, another for the courts. Finally there is real story that is really true and the real story is that it is a rigged deal. Nevertheless, in the first legal go ‘round on the litigation about the bidding, the court (sort of) bought the MTA’s version of events. (See: Thursday, December 17, 2009, Judge, deferring to MTA version of the case, dismisses lawsuit challenging revision of Vanderbilt Yard deal.) That is because whatever stories public officials tell, courts have been deferring to them and thereby promoting rigged deals and government misconduct. The same thing was true in the eminent domain abuse case brought against the Atlantic Yards project. The public authorities involved told the public one story (Atlantic Yards was an “economic development” project) and told the courts another (that it was ostensibly to remove “blight”) while the real truth was again something quite different, that a wired no-bid deal was being handed to Ratner to eliminating the competition from other developers in his back yard. We told the MTA that this was a deal that they could easily stop and that they could thereby recoup for proper use the hundreds of millions of dollars in misdirected moneys. All it would take is for the MTA to settle the lawsuit brought against it by the coalition of community groups and elected representatives and then properly bid out its property to multiple developers. We said more, which we will get back to. Had we had more time we also would have said that the MTA cutbacks must be looked at in terms of big-picture city development policy. Can we really say that the money that is sent to the MTA, all the taxpayer money that comes to the MTA is well spent? Are we in a position to be able to say that? Because if we are going to be in an environment where we are talking about truly painful things, in which we are doing things that hurt people’s lives and well-being then we need to be able to say that and, unfortunately, I’m not sure that we can. In the two months that I’ve been here, it’s apparent to me that we don’t operate in a way that ensures that every taxpayer dollar that we receive is being used as effectively as possible . . .
We need to rethink every aspect of our operation. We need to permanently reduce the cost of what we are doing. In short, we need to take the place apart. Now I know that this is hard, but in the economic time this is what businesses all across the state are doing. They can’t afford to fail when they do and I don’t think we can afford to fail when we do it. • Last week Governor Paterson was telling us that the state had only $3 million in cash on hand and that the legislature needed to act because dire, drastic cuts were in store. How can Governor Paterson expect legislators to take him seriously about legislative branch-controlled spending when he has refused to do anything about Atlantic Yards, which is the premier example of executive branch-controlled pork barrel spending. Therefore, why shouldn’t we expect the same thing from Chairman Walder, the saying of one thing while meaning something else entirely. In dysfunctional New York, Chairman Walder is not the only one with deceptive rhetoric we need to navigate around to make sense of the world. City Council Speaker Christine Quinn was present at the MTA board meeting to speak out against the cuts. Unfortunately Speaker Quinn was not present this summer to protest the MTA’s giveaways to Forest City Ratner. It was to be expected: She rarely challenges Bloomberg or his giveaways to the real estate industry. Ms. Quinn has never taken the opportunity to criticize Atlantic Yards and she has frequently supported the kind of eminent domain abuse occurring in connection with the Atlantic Yards mega-monopoly, the Columbia expansion taking over West Harlem and the wholesale eviction of the Willets Point neighborhood. Similarly, the Working Families Party, closely connected* with ACORN, has been sending out e-mails urging protest of the MTA cuts. (Sample quote: “Even Ebenezer Scrooge would cringe. But the real problem isn't just the MTA - it's Albany.”) But the WFP hasn’t taken a position against Atlantic Yards despite its drain on the city, state and MTA budgets. Everyone believes the reason that WPF hasn’t is that the perpetually self-interested ACORN has essentially been bought and paid for by Forest City Ratner. Mr. Walder is yet another of the public officials who have the power and responsibility to kill Atlantic Yards. Let’s see if one of those public officials takes that responsibility seriously and acts accordingly.
. . . in recent months, we at the New York City Economic Development Corporation have become aware of a secondary benefit of our new-found market position. Specifically, we have begun to see a rise in the number of bids—and bidders—chasing the $2.5 billion in capital projects that we plan to manage over the next five years. . . . . this is also great news for taxpayers, because increased competition for bids almost always means better rates for the public. Over the long run this will result in projects completed more quickly and more efficiently. One more thing about Mr. Pinsky’s insights: We told the MTA board exactly that back in June reprising of our comments before ESDC.